One dough, two ovens -- gosh! Having decided to wander over to the Bread Banquet being held in another neighborhood, I decided I'd take advantage of the fact that there would be a wood-fired oven stoked up and available to anyone who wanted to bake. Since this event wasn't going to start until 2pm Saturday, I mixed the dough mid-afternoon on Friday, gave it a couple of hours of BF with one fold per hour, then put it in the fridge until after dinner. Took the dough out of the fridge, let it warm up a bit, divided, preshaped, rested, shaped, rested and back into the fridge. By then it was about 2am. This was making me a bit nervous, since Susan's original recipe calls for three hours of bulk and three hours of proof, and here I was, spinning the process out over 24 hours. We took one beswaddled loaf to the event, which was full of workshops for learning about wheat and grains and bread making, mostly geared toward children. The WFO was there, with space for me, so we unwrapped the loaf, I spritzed, the baker scored (amazing speed and sure-handedness), and into the oven it went. "Come back in about an hour". OK.
An hour later, we learned that there had been "issues" with the oven, so our loaves had been removed to a local bakery. When I saw mine, my heart sank. And it made me very worried about the second loaf that was waiting at home in the fridge. Preheated the oven,went through my usual spritz/seed/spritz/score/spritz routine and loaded the loaf, 20 minutes covered, 18 minutes uncovered. I am really surprised at the difference in the two bakes. Both loaves weighed the same before baking, give or take three grams. 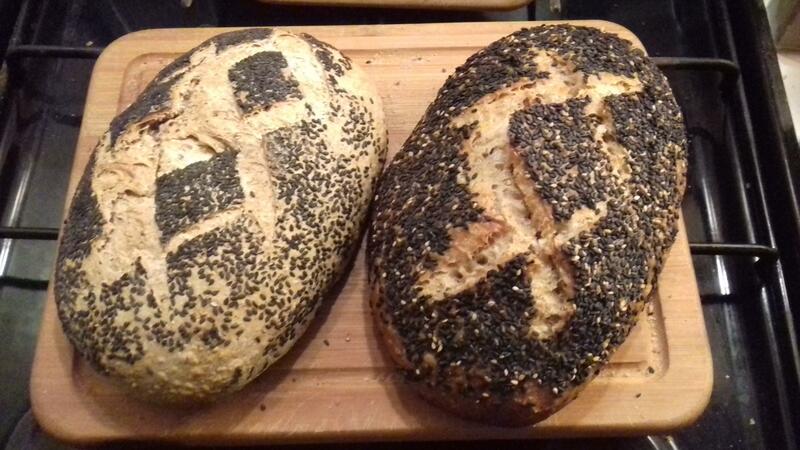 I had assumed that the wood-fired oven would give a beautiful brown crust, hopefully with loads of blisters. The top looked like it had actually caved in (or someone stuck a thumb into it). 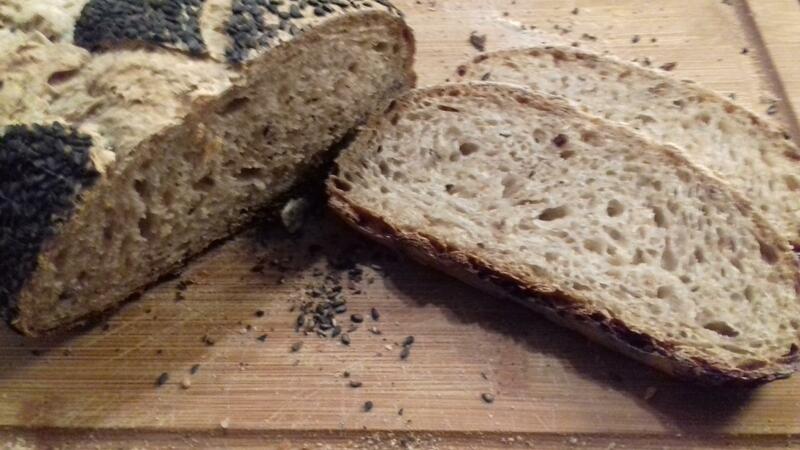 Crust was extremely thick and hard, bottom was charred and crumb felt wet. Not gummy, just damp. I now have a huge bag of croutons (which will, among other things, wind up in future breadcrumb loaves). So, if the occasion should present itself ever again to use a WFO, what are the pitfalls to watch out for? Did the loaf need to be in a DO? Or was this the result of the loaf having been pulled out of one oven to be moved elsewhere? It looks like the issues may have been lack of stored heat in the WFO if it was going to take an hour to bake and still had to be finished off in another oven nearby. But good for you for being involved. the home bake looks pretty good! i got to see a great home wood fired oven and meet with its owner and builder when in France recently in Guizerix and hope to be baking in it on my next visit. Yeah, I'm beginning to think that the WFO was not up to temperature when the loaves went in. Which meant that the dough was drying out on the surface more than baking. Ah, well. I don't know Guizerix, but judging by the spelling, I'd wager it was in the Basque country (which I love)? Miles better hand the one used for the banquet bake. Kudos to your pal. Lovely region, although I know the Toulouse-Albi side better. In fact, will be back there for Christmas. Nothing like a WFO to mess your bake day! Too hot, too cold not heated long enough, not enough bread in it to steam properly and who knows what else. Now you know why traditional artisan bread can only be balked in a WFO. 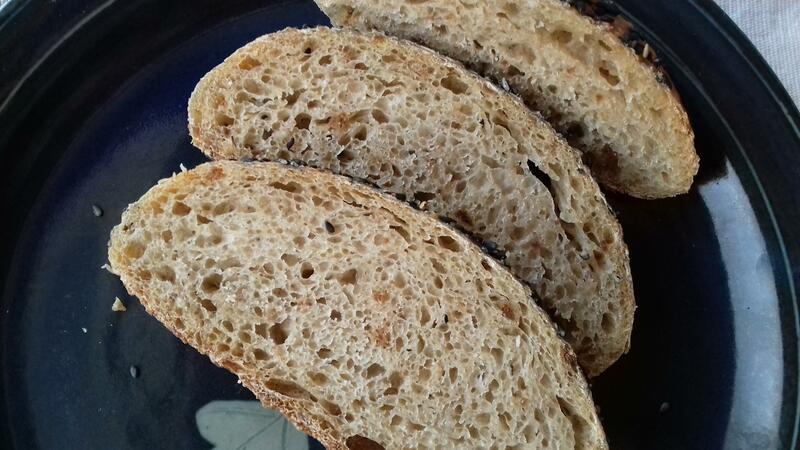 Mastering the WFO is just as important as mastering the bread to get a real artisan loaf out of it! Everyone looks forward to baking it one but few actually have their bread come out right the first time or even 10 :-) The one baked at home was much better for sure.